A drone-powered revolution is underway in the enterprise as a growing list of industries continue to adopt unmanned aerial vehicles (UAVs) for a broad range of business applications to facilitate transportation, agriculture, construction, mining, energy, law enforcement, and much more. Drones are making the transition from a novelty technology to an integral business tool, with an estimated market value of over $127 bn in commercial applications, according to a study by PwC. The transportation industry (air, rail, road, pipelines), for instance, is utilizing drones to conduct inspections at remote or hard-to-reach maintenance sites, which not only reduces internal staffing requirements but also prevents workers from being in harm’s way – not to mention the faster turnaround times and reduced traffic closures. Similarly, in other industries, drone-powered solutions are used to address day-to-day business operations like aerial surveying in agriculture, mining, and oil and gas sectors. Other compelling applications now go beyond inspections as larger drone are used to assist installations, precise spraying, and even repairs. Additionally, drones are gaining prominence for last-mile delivery services for ecommerce giants like Amazon or even medicinal response for disaster relief efforts. Further, the law enforcement sector is using drones to surveille or even track down fleeing suspects. However, the proliferation of drones across industries is not without problems. The growing use of drones has brought about a variety of business challenges related to incorporation of live and recorded drone video into mainstream business operations, as well as the dilemma associated with video storage, security, management, accessibility, and distribution – which most companies are not equipped to handle. 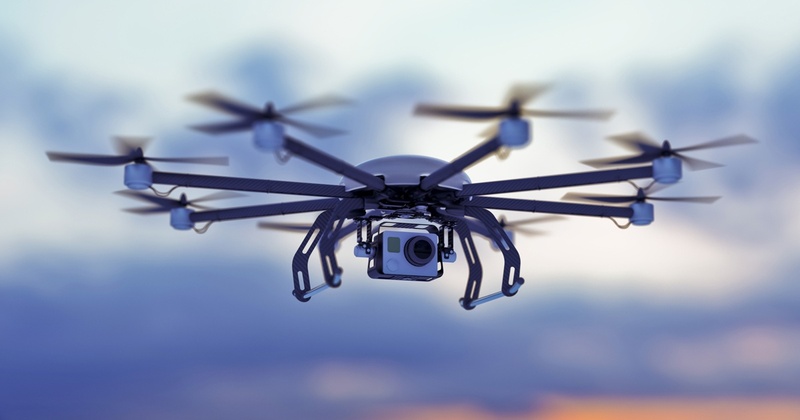 Organizations that plan to or already employ drones in their day-to-day business activities are amassing massive amounts of video footage produced by drones. Not only that, the video footage needs to be securely stored and sometimes maintained for several years, depending on organizational data retention policies, and made accessible for viewing and sharing by relevant employees or authorized personnel – all of which is extremely challenging to accomplish without a robust streaming video solution. VIDIZMO, recognized as a Challenger in Gartner Magic Quadrant for Enterprise Video Content Management, provides a powerful yet easy-to-use video streaming platform that fulfils enterprise needs for live and on-demand video streaming as well as video and digital content management for all media types, including drone video. VIDIZMO provides a comprehensive solution for drone video streaming, capture, ingestion, encoding, transcription, indexing, and storage in VIDIZMO’s centralized video repository, from where all authorized users can conveniently search, view, manage, edit, and share video files to internal and external stakeholders. With detailed analytics and audit trails, VIDIZMO maintains chain of custody requirements for who accessed or shared videos, when, to whom, and how. Moreover, VIDIZMO provides single sign-on authentication with enterprise active directory for secure access controls to the video streaming platform. Additionally, VIDIZMO offers seamless interoperability with a broad range of existing business applications such as other CMS, CRM, LMS, video conferencing or telepresence systems, or IT systems like encoding tools, cloud services, and content delivery networks. Additionally, within the video streaming platform, VIDIZMO provides separate channels with complete user and content segregation for different kinds of video content or interdepartmental use within an organization. VIDIZMO supports any top-of-the-line drone devices, including DJI, Yuneec, Parrot, 3DR, Blade, or any others that have a built-in onboard camera or video capturing device and built-in encoders that support RTMP stream. For ones that do not have built-in encoders or ones that do not generate RTMP stream, we support external mobile encoders that could either be attached to a drone or operated from a drone’s ground control station. Drones with built-in encoders possess their own mechanisms to stream video using Wi-Fi, mobile broadband technologies such as LTE, 4G or 3G, or a SIM attached to the drone. In this case, the drone encoder generates an RTMP stream for the drone video and uses the cellular network support and the internet to transmit that the RTMP stream to VIDIZMO streaming server. From there, any live video is available on VIDIZMO's video streaming platform for VIDIZMO users to access from any device, browser, location, or bandwidth conditions. Upon receiving the live stream, VIDIZMO streaming server also archives and stores all live drone video in its storage servers for on-demand viewing at any time, from any device. Recorded videos are securely stored in VIDIZMO’s repository for an indefinite amount of time, from where users can download, edit, manage and play the videos at a later time. Many contemporary professional drones do not come with built-in encoders and they only stream drone video in proprietary formats that cannot be streamed and broadcasted to the web. To resolve this, VIDIZMO support two solutions. The first is to attach a portable mobile encoder such as Soliton’s smart-telecaster Zao-S or Streambox AVENIRDrone Encoder Pro to the drone. These miniature encoding devices, weighing about 350-400 grams, are mounted directly onto drone cameras to enable full live HD video transmission of live drone video using a variety of mobile networks, including 3G, 4G, LTE, Wi-Fi, Ethernet, WCDM, among others. The mobile encoder converts the drone's HDMI output to a RTMP stream. Following this, the encoder uses the best possible pathway from the available networks to transmit live stream to VIDIZMO streaming server from where VIDIZMO captures, transcodes and further processes the stream for high-quality live or on-demand video output with minimal latency via VIDIZMO's video streaming platform to all user devices. For drones that do not have a built-in encoder or ones that dont provision a mobile encoder attached to its surface, VIDIZMO support a second solution shown below. In many cases, professional drones cannot support a mobile encoder attached to its surface. This is because professional drones often have a lot of sophisticated features and functionalities like improved elevation, durability, GPS plotting accuracy, battery life, weight carrying capacity, camera resolution, or number of attached cameras even sensors to pick up detailed sensory information along with the video stream. For such reasons, these drones depend on the ground control stations to take care of all streaming needs. In such scenarios, the drone captures video stream in a proprietary streaming protocol, which is received on a screen in the ground control station that displays the video being captured by the UAV. The drone video’s HDMI output from the ground station is then input through an encoder attached to the screens in the ground station, which then converts the HDMI output to an RTMP stream that is pushed to VIDIZMO streaming server. From there, the drone video is streamed live through VIDIZMO's video streaming platform to all user devices or it is a recorded and stored in VIDIZMO’s video repository for on-demand viewing later on. Similarly, for drones that do not support RTMP stream, their proprietary stream is encoded using on-ground encoders at ground control stations that convert the HDMI output from the proprietary stream to RTMP for further processing and streaming through VIDIZMO. To learn more about VIDIZMO’s drone video capture, streaming, or enterprise video content management capabilities, contact us today or visit our website for details.